There is perhaps irony in the fact that Genghis Khan, the worst known mass killer in the known history of the world set the stage for the first “great awakening;” a period of great spiritual, mental and social development in what became the first great world empire. He had to build an army and slaughter between 20 and 60 million people, about a third of the known world population of that time, to accomplish it. Born into a fierce fighting tribe of Borjigins in about the year 1162, Genghis Khan was given the name Temujin after the chieftain of a Tatar tribe that his father, Yesukhei, had captured. Mongolia, like much of the rest of the world at that time, was comprised of small tribes of people who were constantly at war with each other. Consequently Temujin was schooled in the art of warfare from the day he was old enough to pick up a sword. Two important events occurred when Temujin was nine. He was introduced to Borte, a woman from the Konkirat tribe who was pledged to later become his bride. Also, the Tatar tribe took revenge and murdered Temujin’s father, Yesukhei. This launched a conflict within the Borjigins as Temujin and his half-brother, Bekhter, fought over tribal leadership. After Temujin killed Bekhter he confirmed his position as head of the family. When he was 16, Temujin and Borte were married, thus cementing an alliance between the Borjigin and Konkirat tribes. They had four sons together and Temujin had many other children with other wives. It is important to note that his sons with Borte were considered the rightful successors in the family. By the time he was 20, Temujin was obviously sick of the constant warfare among the tribes and set about doing something about it. With the help of his brothers and several other clansmen, he began forming a fighting unit. Eventually he had a large army of more than 20,000 men. At that point he set out to conquer the various tribes, seek revenge on the ones that had brought harm to his family, and attempt to unite the Mongols under his rule. It was said that after Temujin’s army conquered the Taichi’ut tribe, he ordered all of the tribal chiefs boiled alive. Temujin proved to be a brilliant military tactician who used is skills to outwit his enemies at every turn. All the time, his army was growing to about 80,000 men. By 1206 his army defeated the powerful Naimans, thus taking control of central and eastern Mongolia. It was at this point that the rival Mongal tribal leaders called for peace and gave Temujin the title of Genghis Khan. The name means “universal ruler.” This title not only gave Khan political power, but declared him a god among men. The leading shaman declared him Kongke Koko Tengri “The Eternal Blue Sky,” thus the ruler of the known world. To achieve such a victory, Genghis Khan’s army slaughtered millions. The worst single massacre left over 700,000 people dead. It was a terrible price to pay to establish the era of peace that was to follow. 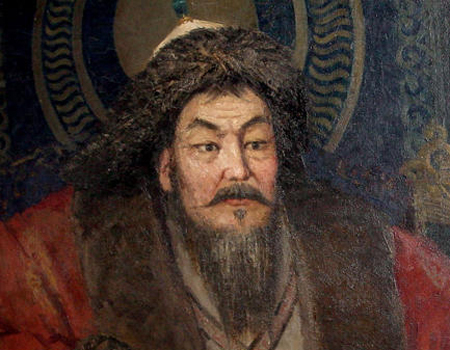 By the time of his death in 1227, Khan’s Mongol Empire was the largest in the world. It was under Khan’s leadership, and the rule of his grandson, Kublai Khan to follow, that the Yuan Dynasty came into existence. It was a period of spiritual, mental and social development unlike anything experienced since.